Your ice cream parlour in Rome is called Caffè Portofino. 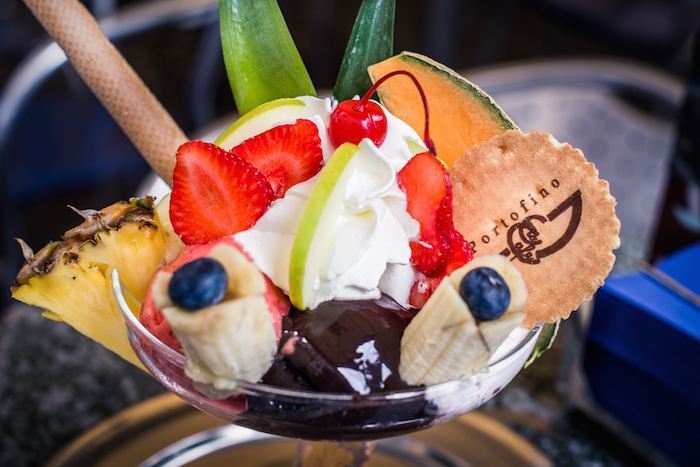 With a large counter dedicated to many different and innovative ice cream flavours, including both fruit and cream, Caffè Portofino’s ice cream is a true specialty. The quality of the ingredients and raw materials used, the freshness of the fruit and the passion with which the ice cream is elaborated make each flavour unique and are the reason for the great success of our ice cream. Among our original ice cream proposals you can find: the steaming ice cream, the volcano cup, the hot delight and also tasty frozen yogurts to garnish as you wish. Apart from the classics, our ice cream parlour in Rome also includes delicious, innovative flavours such as Cheesecake, a soft delight where the biscuit flavour merges with the cream and wild berries to achieve moments of absolute pleasure. Another temptation impossible to resist is the zabaglione ice cream with puff pastry and caramel crumble which will definitely not disappoint our gourmand customers. And what about the soft, delicious whipped cream mousse garnished with red berries? A unique combination with a delicate and refined taste to accompany other fruity or cream flavours. You will feel like you are biting into a cake, rather than a cone. If you think that marrons glacé are just a sweet found in a confectionery, you are wrong. Caffè Portofino will surprise you with a marron glacé ice cream, a traditional taste in which the sweetness of the frosting that envelops the chestnut merges with the firmness of the cream. Do you have a sweet tooth? Then Caffè Portofino’s ice cream parlour in Rome is the place for you! Not only our ice creams but also our frozen yogurt will catch the eye of the sweet of tooth! The white yogurt is served in a colourful cup and can be garnished according to your taste: Nutella cream, Smarties, whipped cream, fruit syrups and other goodies await you to top this great, sweet white cloud. 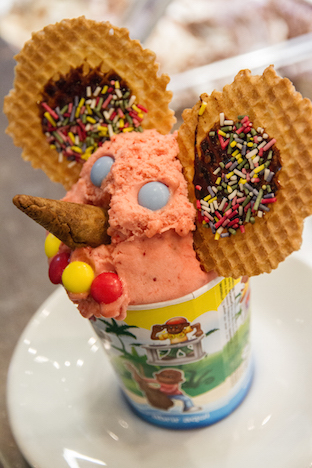 Caffè Portofino also takes into account the needs and imagination of children with its ice creams for kids. Mickey Mouse, Pinocchio, Maya the Bee… and many other beloved children characters take shape in fun, colourful ice creams that make the children go crazy in search of their “idol”. Caffè Portofino’s staff meet the demands of all our young customers by creating different shapes and ice creams every day, playing with the colours of each flavour, the chocolate and fruit syrups, round-shaped or cone-shaped biscuits, chopped hazelnuts and many other goodies. At Caffè Portofino each customer can choose the size of their ice cream: both cups and cones are served in small, medium, large and giant sizes. …there’s more! The ice cream parlour at Caffè Portofino is not only limited to ice cream, it also includes milkshakes, granitas, ice drinks, sorbets and hot drinks with ice cream. So many milkshakes in so many different flavours; following our customer’s wishes. 5 different granita flavours: from the classic coffee with cream to fruit flavours such as lemon, strawberry, melon and watermelon during summer. Ice drinks, where the traditional cocktail base blends with the freshness of a fruit ice cream scoop, which sweetens the alcohol taste of the drink. Some examples? The Alaska: a combination of lemon ice cream and vodka, the Lemongin with lemon ice cream and gin and the Profondo Rosso: a perfect combination of bitter rosso and lemon ice cream. But the real novelty is the Sparkling Cup, in which the lemon ice cream meets the sparkling taste of the wine. Let yourself fall for the marvelous homemade ice creams of Caffè Portofino; unique and to be enjoyed in good company!